The cast from the first Flintstones movie has gone off to break rocks somewhere else. There are still some pretty funny lines and gags. Kids are certain to love The Flintstones in Viva Rock Vegas, but Mom and Dad won't mind going along -- it's a yabba-dabba-delight. As entertainment for kids, or for adults, it misjudges its audience by at least a millennium. We need another live-action Flintstones like we need a club to the head. It's not delightful or funny or exciting, and for long stretches, it looks exactly like hapless actors standing in front of big rocks and reciting sitcom dialogue. Plays like an episode or two of the TV show, stretched out to fill an hour and a half or so. 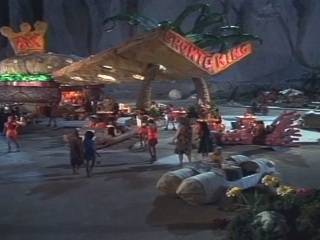 The first live-action movie of The Flintstones in 1994 was a Tyrannosaurus wreck, a production design in search of a story. Now director Brian Levant has made a prequel ... that's almost as dumb. If you are a kid -- or the parent of a kid -- this movie may, in fact, be your best bet out there. But if you are neither, Viva Rock Vegas is much more of a gamble. The key to appreciating The Flintstones in Viva Rock Vegas is low expectations. The Flintstones in Viva Rock Vegas is cute and funny, with plenty of slapstick and cuddly creatures for the kids and enough adult wit to keep parents reasonably amused.